This stylish "Pagoda" 230SL was completed at the Stuttgart-based Mercedes-Benz plant in the latter part of 1965. The elegant livery of Dark Blue over a Light Ivory interior is believed to have been the car's original colors, and this color combination is very elegant and suits the timeless Paul Bracq design on the classic Mercedes-Benz coachwork. The Roadster is believed to have been equipped for the US market since it was fitted with the desirable 4-speed manual transmission and left-hand drive steering arrangement from new. 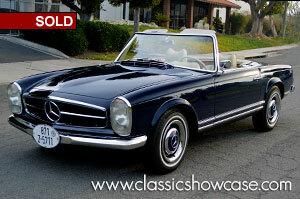 This 230 SL is fit with a period correct Becker Europa radio, and a factory hard top dons the top of the car. This beautiful first-generation Pagoda would make a great addition to any collection and has recently been serviced and is ready for spirited driving, or concours displays. Launched at the Geneva Auto Salon in March of 1963, the 230SL—or W113 in Mercedes-Benz language—was a very different sort of sporting car then its fire-breathing predecessors. Intended as the replacement for the 190SL, the 230SL abandoned its predecessor's four-cylinder engine in favor of a 2.3-liter fuel-injected six-cylinder SOHC engine, producing 150 bhp. The new engine was derived from that of the great 220SE. The Paul Bracq-penned body was an all-new, stylish design which became an instant classic. Beneath the skin, the running gear was conventional Mercedes-Benz, featuring all-round independent suspension (by swing axles at the rear), disc front/drum rear brakes, and the choice of a four-speed manual or automatic transmission. Top speed was in excess of 120 mph. This was one of the last Mercedes Benz to use a rear wing axle. Christened "pagoda top" after their distinctive cabin shape, these SL models were amongst the most-loved sports-tourers of their day and continue to be highly sought after by collectors.